I love the color of this quilt. It is bold and exactly as is seen in picture. Adorn your bed with artistic flair using this Five Queens Court Cameron quilt featuring a watercolor pattern in cool blues and greens. The oversize cotton coverlet keeps you warm and cozy all night long. Love it....doing a beach/surf theme in my son's room and the colors are perfect for my soon to update blue paint theme. He has a loft bed and the quilt tucks nicely under the matress and in between the framework of the loft so I don't battle the puffiness of a comforter. He also is a warm bodied sleeper at night and typically gets too hot with traditional comforters so the quilt is a perfect thermal thickness for his needs. 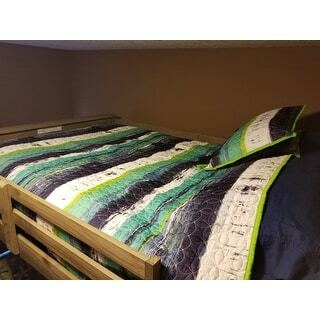 Really a very cheaply made quilt, we are sending it back because it is so poorly made and Overstock is charging us $ to send it back. I am not impressed by the product or by Overstock. The oversized quilt completes my guest room perfectly. I have a sailboat/nautical theme and the colors of the quilt are perfect. My king bed sits high off the ground and the quilt fits. This oversized quilt with matching pillow shams is absolutely beautiful. Brightens up the entire room, looks even better in person. Very well made. Very nice and great quality. It fits perfectly in my guest rooms. Colors the same as showed on photos. We recently purchased the quilt in King. A happy wife is a happy life, but when I found out the shams weren't included I was shocked! For that kind of price, the shams should have been included. The item was shipped promptly and as advertised, ,but can a guy get a break on the shams? Love that the fabric breathes unlike so many synthetic materials found in most bedspreads today! This quilt is so pretty, and livens up the room a lot! It's well made, sturdy, washable. I love it. The quilt is wonderful. Well made the material is light but sturdy. The colors are wonderful, I didn't want to spend the money and tried a cheaper alternative boy was I disappointed. Glad I broke down and purchased it. "Is this a quilt or duvet cover?" Just painted our bedroom lime green. 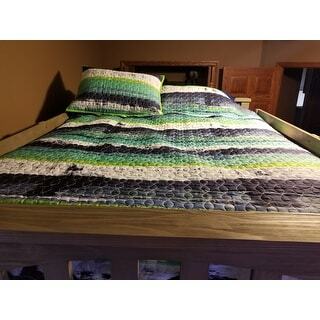 Bedspread should look good.